While the TIE Attack Pack is nothing new to Star Wars Galaxy of Heroes players, I finally broke down and decided to buy in. I still think there is a good chance that SWGoH will add a Death Star Raid or something similar (maybe Starkiller Base? ), so I want to ensure I am prepared. So since I decided to jump in on this I felt it only appropriate to share my findings. So what do I get for my 2,999 crystals? Each pack guarantees a FULL SHIP! …Each pack guarantees 4 blueprints for each TIE Advanced and TIE Reaper with a chance to get a 25 Blueprints. So my rewards ended up to be what I wanted – Vader’s TIE Advanced. Given I have a gear 11 Vader (Zader) with over 10k power I figured this would be of greatest benefit to me to open his ship rather than the TIE Reaper with the Shoretrooper (Level 1) and Death Trooper (Level 53). In the TIE Attack Pack the materials are not that great, but the guaranteed ship is nice. My biggest complaint in any of these pack is that the materials are crappy on top of the only getting 5 shards each time, like in the Citadel Pack or Lord of Hunger packs, but in this pack at least we get a guaranteed nice prize. Overall, this is a better value than most of the packs I have bought and evaluated, but still not anything I consider to be a great deal. 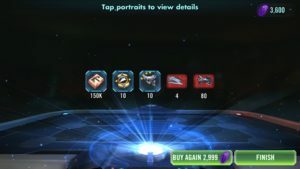 Be the first to comment on "SWGoH: Should I buy the TIE Attack Pack?"